The Most Prolific Lightning Storms On Earth Occur Where? A popular holiday tradition in countries like the United States is a party game known as a “white elephant gift exchange.” The basic premise is that each participant brings a gift, typically inexpensive, humorous, and not something the recipient would normally want as a gift, and the gifts are exchanged by unwrapping them in sequence wherein each new recipient can swap out their gift for a previously opened gift. The goal of the game is to swap out your “white elephant” for a gift you really want. While the modern incarnation of the white elephant exchange is a harmless way to make light of how seriously some people take gift giving and playfully vie for the “worst” gifts, the origin of the game’s name has a darker history. 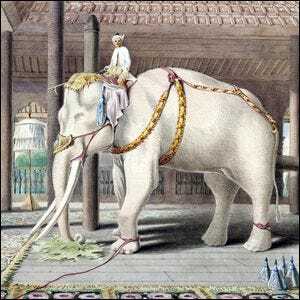 In the ancient kingdom of Siam (now Thailand), white elephants were revered as sacred and kept by the royal family. If a member of the royal court displeased the royal family, they would gift a white elephant to them. While, on the surface, this seems contradictory because the king would gift a sacred animal to a person he did not care for, it was actually an extremely clever way to punish the courtier. The cost of upkeep for any elephant, let alone a sacred white elephant, was astronomical and the gift was essentially a promise of bankruptcy.